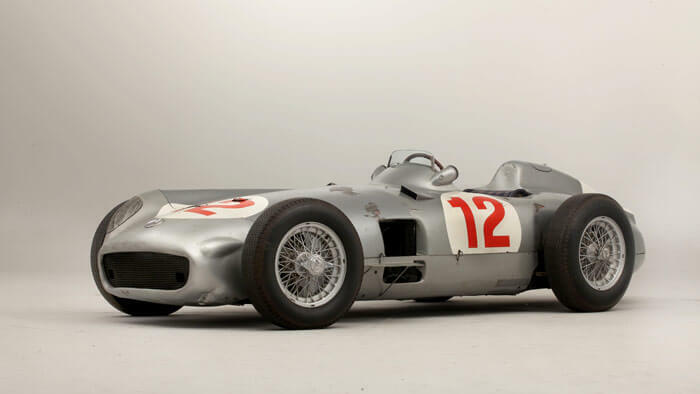 The 1954 Mercedes-Benz W196R Formula 1 racing car driven by Fangio sold for $30 million by Bonhams Auctions at Goodwood Festival of Speed Sale 2013. The 1954 Mercedes-Benz W196R Formula 1 single-seater racing car driven by legendary five-times world champion Juan Manuel Fangio became the most-expensive car ever sold at auction. 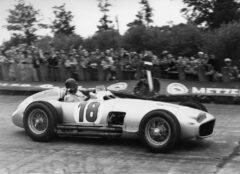 The Mercedes-Benz racing car fetched a record breaking £19.6 million ($29.65 million) at the Bonhams Auction held during the Goodwood Festival of Speed sale. The price was almost double the previous record achieved by a Ferrari in 2011. 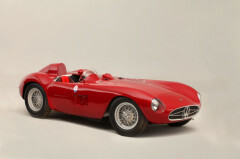 The auction further set a record for the highest grossing motorcar auction ever in Europe as well as the highest price ever paid for a Maserati car. It was generally expected that the sale of the 1954 Mercedes-Benz W196R Formula 1 single-seater racing car would break the world record for the highest price ever paid for a car at auction. However, at the Bonhams Goodwood Festival of Speed Sale on July 12, 2013, the Mercedes positively shattered the old record. The hammer came down at £17.5 million but once the regular auction costs and fees were added the 1954 Mercedes-Benz W196R Formula 1 achieved £19,601,500 (US$29,650,095 or €22,701,864) to become the most valuable car ever. The price achieved for the Mercedes-Benz W196R Formula 1 racing car was almost double the price of the previous record holder: a 1957 Ferrari 250 Testa Rossa sold in 2011 for $16,390,000 by Gooding & Co at Pebble Beach. The previous record for a Mercedes Benz car was only set a year ago: a 1936 Mercedes Benz 540K Special Roadster sold by Gooding & Co’s auction in Pebble Beach for $11,770,000. Juan Manuel Fangio drove the Mercedes-Benz W196R to his second Formula 1 world championship in 1954. The car not only won the championship, it also announced to the world that Mercedes Benz has recovered its reputation for automotive excellence. The Mercedes-Benz W196R Formula 1 racing car was given to National Motor Museum at Beaulieu by Mercedes Benz in 1973. In 1987, Beaulieu sold the car – with Mercedes Benz’s approval – to fund the museums library and other buildings. The car has been in private hands since. It will take a very exceptional car to ever break this record. In the excitement of the highest price ever paid for a Maserati car at auction, another record achieved by Bonhams at Goodwood is easily overlooked. A 1955 300S Sports-Racing Spider sold for £4,033,500, almost double the previous record of £2,251,520 achieved for the marque a year ago. Bonhams now holds the world records for the following marques at auction: Aston Martin (£3,200,000), Austin-Healey (£843,000), Bentley (£5,000,000), Maserati (£4,033,500), Mercedes-Benz (£19,601,500) and Rolls-Royce (£4,700,000). Alfa Romero was added in September 2013 at £5,937,500.) The 1929 Bentley „Birkin Blower“ sold by Bonhams last year for $7,867,000 is also the most expensive British car ever sold at auction. The 2013 Bonhams Goodwood Festival of Speed Sale grossed £36,072,464 – the highest ever for a single motorcars auction in Europe. See also other classic cars auction results.